Lang standard schrader hose assembly with quick coupler plug. Fits TU-443, TU-448, TU-480A, TU-485A, TU-540, and TU-550. Lang Hose 3/16'' Id X 6 feet. Fits 74476. Lang 1/4'' I.D. X 6'' fuel hose. Fits TU-485A. Lang 5/16'' I.D. X 6'' fuel hose. Fits TU-485A. Lang 3/8'' I.D. X 6'' fuel hose. Fits TU-446 and TU-540-2. 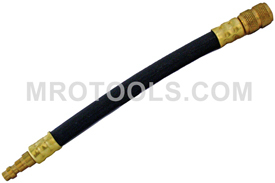 Lang 3/16'' hose barb X QC body. 3/16'' hose barb x quick coupler body. Fits 74476. Lang 3/16 hose barb X QC plug. 3/16'' hose barb x quick coupler plug. Fits 74476. Lang bent tube with 3/8'' inverted flare nut. Dimensions: 3'' X 4'' X 0.688''. Fits TU-443 and TU-469. Lang 5 Pack - Oring 5/16'' x 7/16''. Fits TU-443-2 and TU-443-3. Lang 5 Pack - Oring M14 .424'' ID x .103''. Fits TU-443-2 and TU-443-3. Lang M16-1.50 female by 3/8'' Tube End. Dimensions: 3'' X 4'' X 0.875''. Fits TU-443, TU-480A, and TU-540-2. Lang M14-1.50 female by 3/8'' Tube End. Dimensions: 3'' X 4'' X 0.875''. Fits TU-443, TU-480A, and TU-540-2. Lang J-body adapter. Union 3/8'' inverted flare by M16x1.50. Fits TU-443, TU-480A, and TU-540-2. Lang M8-1.0 female by M12-1.50 Male. Dimensions: 3'' X 4'' X 0.688''. Fits TU-443, TU-480A, and TU-540-2. Lang M10-1.0 female by M12- 1.50 Male. Dimensions: 3'' X 4'' X 0.688''. Fits TU-443 and TU-480A. Lang OTC male quick coupler plug, conversion adapter for OTC. Dimensions: 3'' X 5'' X 0.5''. Lang Standard Schrader hose assembly from TU-113. Lang small parts kit from TU-113. Lang Small Schrader hose assembly from TU-113. Lang M6-1.0 (Honda) hose assembly from TU-113. Lang Volvo adapter, 14mm LH Jetronic. Fits TU-443, TU-540, and TU-480. Lang M11 O-ring adapter for popular Nissan and Infiniti models. Fits TU-550, TU-443-2, TU-443-3, and TU-540-1. Lang M14-1.50 3/8'' inverted flare male and female connections. Adapter for Geo Storm and Isuzu I-Tec systems. Fits TU-443, TU-448, TU-480A. Lang Ford CFI adapter, 5/16'' quick disconnects. Fits TU-443, TU-448, TU-480A, and TU-485A. Lang Ford EFI spring lock adapter with quick Coupler Plug. Fits TU-443, TU-448, TU-480A, TU-485A, TU-540, TU-550. Lang spring lock adapter with small Schrader test port for TU-113. Lang adapter, 5/16'' Quick Disconnects with small Schrader for TU-113. Lang manifold with Quick Coupler Plug for 5/16'' and 1/4'' ID hose. Fits TU-443, TU-480A, TU-485A, TU-540, and TU-550. Lang small Schrader hose assembly with quick coupler plug. Fits TU-443, TU-448, TU-480A, TU-485A, TU-540, and TU-550. The 71318 Lang Standard Schrader Hose Assembly With Quick Coupler Plug is one of thousands of quality tooling products available from MRO Tools. Please browse Lang Gas - Petrol Fuel Injection Pressure Testing Equipment for tools similar to the 71318 Lang Standard Schrader Hose Assembly With Quick Coupler Plug. 71318 Lang Standard Schrader Hose Assembly With Quick Coupler Plug description summary: Lang standard Schrader hose assembly with quick coupler plug. Fits TU-443, TU-448, TU-480A, TU-485A, TU-540, and TU-550. Quantity discounts may be available for the 71318 Lang Standard Schrader Hose Assembly With Quick Coupler Plug. Please contact MRO Tools for details.